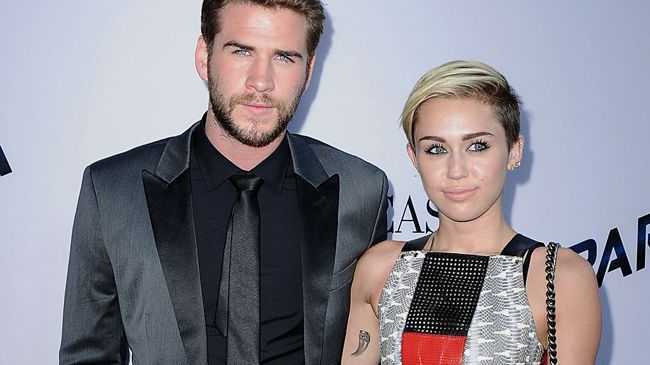 MILEY Cyrus doesn't want to marry Liam Hemsworth. The 'Wrecking Ball' hitmaker recently rekindled her engagement with the 26-year-old actor following their split in 2013 but, although he's desperate to get hitched as soon as possible, she reportedly doesn't want to rush into the wedding because she doesn't think she's "marriage material." A source told Australia's NW magazine: "She's dropping all these hints that she's not marriage material but he's not catching on at all." Liam's brother Chris - who has three children India, four, and two-year-old twin boys Tristan and Sasha with his wife Elsa Pataky - has reportedly clocked on to Miley's reservations and is worried things will go sour between them again. The insider explained to the publication: "While Miley may love him, if they don't get on the same page soon, it'll only end in heartbreak for him." However, the 23-year-old singer has no trouble voicing her opinions as she recently admitted that she hates the diamond ring Liam proposed to her with and she sometimes doesn't wear it because it's "too bling." She said recently: "This is really weird because this is like real jewellery and most of my jewellery is made out of gummy bears and cotton candy and they don't look that good together because they kind of mix up, so sometimes I replace it with an actual unicorn or a Looney Tune. "And he's kind of like what's going on? It's like, 'Well, this isn't really my aesthetic, but I'll wear it because you love me.' "
The pair first started dating in 2009 after they met on the set of their movie 'The Last Song' and became engaged in 2012. However, things came crashing down a year later and they went their separate ways, although they've always claimed they "love" each other. They got back together late last year and Miley sparked rumours the wedding was back on after she slipped her ring on her finger in January.